Kochi: India’s production of natural rubber has increased 28% over last year, but traders fear additional supplies and global economic slowdown will squeeze demand. Domestic prices for rubber have already declined to below international levels and the global financial turmoil could dent rates further, some traders said. Tyre makers account for more than 50% of the natural rubber consumption in the country. In 2007-08, the tyre sector consumed 495,550 tonnes of rubber, or 58% of the total production of 851,455 tonnes, Budhraja said. Rubber prices had shot up to beyond Rs140 a kg by late August, but declined to as low as Rs113 a kg on Wednesday as supplies increased after the monsoons, according to data from the Rubber Board, a government trade promotion body. The current price of rubber in the international market is Rs126 per kg. 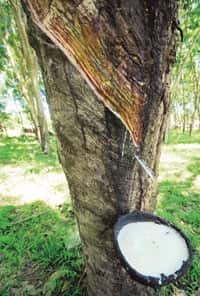 Production of natural rubber between April and August jumped to 312,500 tonnes from 244,070 tonnes in the same period a year ago, when plantations in Kerala, the top rubber producing state in the country, remained untapped for weeks because of a near-epidemic of chikungunya. In 2006, rubber production between April and August was 308,660 tonnes. Rubber exports rose 66% to 16,200 tonnes from April to September and imports dropped to 35,400 tonnes from 39,495 tonnes a year earlier, according to the Rubber Board. Sajen Peter, chairman of the Rubber Board, said tyre manufacturers would buy rubber from the domestic market at Rs3 a kg less than the international price, so they would be insulated against freight and other costs. This would also ensure steady intake of rubber produced in the country, Peter added.